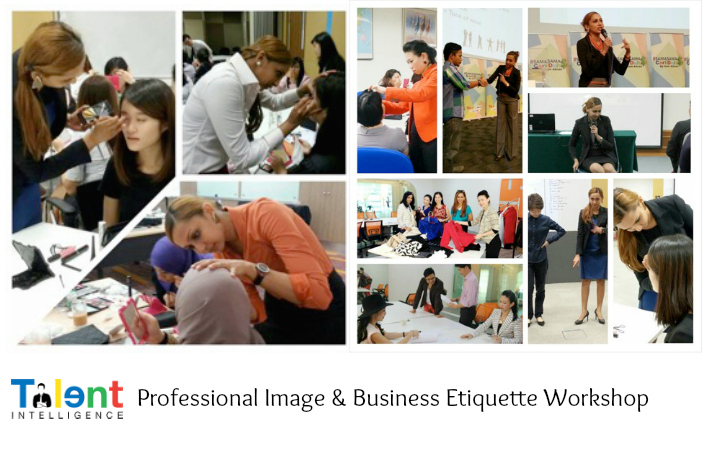 Professional Image & Business Etiquette workshop is a comprehensive training program that equips professionals at any level within an organization with the right tools to sharpen their image. Our approach strives to be highly interactive, with 90% activity based experiential learning, so that participants grasp new concepts in a fun and safe-learning environment. Our consultants will give an insight to the theories and engage participants in active, interactive discussions. Participation and interaction of participants will be the key focus to meet the objectives of this course. Course methods will include exercises, role plays, case studies, and multimedia and image props. > How to create a great first impression! > What is image in relation to your role in the company? > What apparel is appropriate in today’s business arena. > Body line Analysis to determine the best cutting for individual. > Appropriate accessories to style up for different occasions: shoes, belt, scarf, earrings or jewelry. > What is effective eye contact? > Meeting & Greeting Savvy – Introduce yourself and others with confidence. > Become a savvy host and gracious guest. > Learn the proper seating guidelines. Bkay Nair is a graduate of Law from the National University of Malaysia, LLB(HONS) and a Model who founded Bkay Nair Resources to help men and women define and refine their image and style through wardrobe, communication, and etiquette and protocol skills. As an active participant in Malaysia’s entertainment industry, Bkay is in a great position to lead anyone to discover their inner starlet - whether they intend to pursue showbiz, move up the career ladder, or simply just have an advantage with by being more groomed. Her work in the Malaysian entertainment industry puts her in the spotlight frequently, and she realizes first hand the value of poise and a well put together appearance. She has appeared in 4 films including (Ratu The Movie, Raya Tak Jadi, Bujang Terlajak & Ngorat), as well as key roles in a few tv series. She has been featured in and interviewed in various publications including: Mstar, Berita Harian, Utusan Malaysia, URTV, Media Hiburan, as well as appeared on RTM,TV3, NTV7 and Astro. She is the title holder of Miss India Tourism 2007/2008, as well as a finalist for Miss Malaysia India Global 2008/2009. Bkay is a trained and certified groomer where she has been awarded The Certificate in BrandImage™ Professional (CBIP) certified by BII (BrandImage™ International Institute), OUM (Open University Malaysia) and MABIC (Malaysian Association of Brand and Image Consultants). Bkay Nair is also a certified trainer in Accelerated Learning in Action Programme (ALIA). A philanthropist at heart, she has involved herself in many events and programme doing social service for women and children in need through Soroptimist Ampang International and World Hijab Day International. She has been doing public seminars and workshops to hundreds of Corporate participants as well as catwalk trainings for models and upcoming models, also one-on-one consultation for Executives, Professionals, Customer Service Personnel and etc from various fields.